Make this your final stop before considering disc surgery on your neck or low back! 1. What is DRX Therapy? Decompression is an advanced technology of intermittent traction with a controlled amount of force to a specific spinal segment. The injured disc is located and gently separated, creating a small vacuum, which allows the disc to be "pulled back in" taking pressure off the surrounding nerve roots. 2. What does DRX stand for? D.R.X. stands for Decompression Reduction Extraction. DRX 9000 is the best quality and most researched decompression device on the market. Dr. Yanez has 4 years of experience using this machine with great success. 3. How long does each session take? Plan on being here for an hour. The decompression procedure will last from 25-30 minutes. It consists of a comfortable mobilization of the troubled area of your spine. Next we will "re-educate" the lumbar muscles using muscle stimulation that will help your muscles hold it in this new position. This takes an additional 10-15 minutes. During some visits, you may also receive a spinal adjustment. 4. When can I expect to start feeling results? A few patients begin to feel some relief after only three sessions. 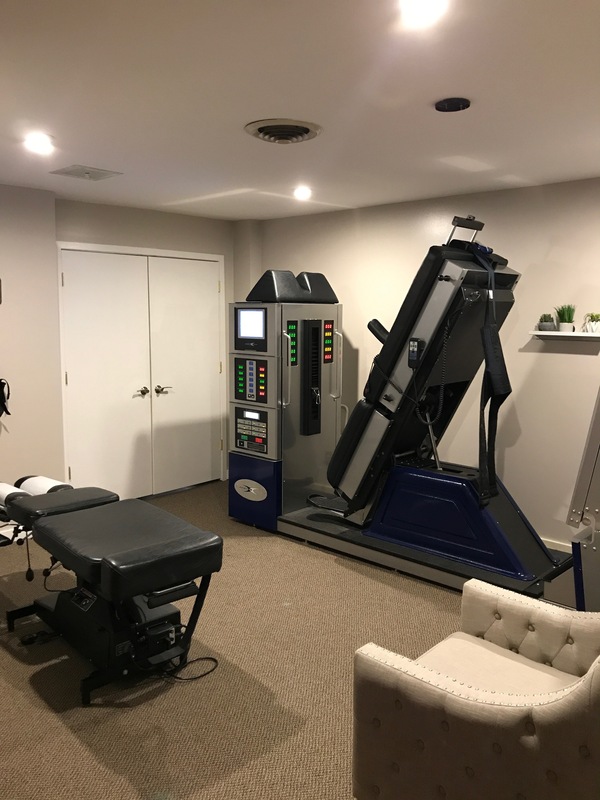 On the average, however, most patients start feeling results at about two weeks or half-way through the decompression therapy. There are always exceptions to this however, and there are a fair amount of patients who don't start feeling results until the third and sometimes fourth week. All of this is determined by the size of the disc injury in your back and how long it has been there. The decompression procedure does not hurt. In fact to most patients say it feels good. However, after lying down for 20-30 minutes, there may be some mild discomfort after standing up just as you may experience pain upon arising in the morning. The discomfort will be from the change of position, not from the decompression procedure. 6. How good are the results? In two large, independent studies of DRX decompression therapy, both came up with the same results--86% success rate. That of course, is determined by how compliant the patients are to the specific decompression therapy protocol. These results are very high. However, it should be noted that one or two people out of 20 will not get positive results and in fact require other types of treatment and maybe even surgery. The good news is that approximately 18 out of 20 patients that complete the DRX Protocol can expect to have positive results. 7. What is the Frequency of Treatments? The goal of each DRX session is to remove the bulging disc pressure from the nerve root. This means re-educating the disc and muscles to be in a better position. The frequency and number of session can vary depending on your case. However, the typical frequency of a prescribed twenty sessions is: Daily sessions four days a week for two weeks, followed by three times per week for two weeks, completing with two times per week for two weeks. Compared to surgery, a less-than-active lifestyle or degenerating a disc in your spine, the DRX option is reasonably priced. 9. Does my insurance cover the cost? Many insurance companies recognize the value of this type of therapy and cover it. Coverage will vary depending on your particular policy. Our insurance department will verify your insurance coverage for you and report to you directly what they were told before beginning the protocol. 10. What happens if I miss an appointment? Studies have shown 86% positive results using decompression therapy. This 86% success rate, however, is achieved when a certain protocol is followed. It is the consistency of the decompression therapy that is effective. If you miss an appointment, that will slow down the results. Certainly, emergencies in life happen and you may have to miss an appointment. Missed sessions may effect the outcome. As always at Semlow Chiropractic we try to accommodate our patients. If you are unable to make a scheduled appointment, we may be able to schedule you later in that day. However, due to the high demand for the unit itself, it may be difficult to always fit you in at another time. Because we are working on a nearly-full schedule for the following month, we may not be able to make up your missed appointment. There is a harness that attaches to your lower back and goes between your legs. Dresses or skirts would not be appropriate. Shorts and comfortable slacks would be more desirable.